I somehow managed to take what was supposed to have been a quick and simple stir fry and turn it into a two-day preparation. This meal is from the book Modern Spice , and the focus of this book is on updated, doable dishes that bring forth the great flavors of Indian cuisine without extreme effort. And, I completely ruined that concept when I went and made my own chutney. After calling around town in an attempt to locate prepared tamarind-date chutney, I learned it was available at one market. When I arrived at that market, there were several other chutneys from various brands and some wonderful, natural, preservative-free options. However, there was only one brand of tamarind-date chutney, and it was not so free of preservatives. A quick online search led me to a simple recipe for making my own, and so instead of purchasing a jar, I bought jaggery, tamarind paste, and dates. I exaggerated a bit when I said I stretched this into a two-day process because making the chutney takes about 15 minutes total, and the stir fry comes together in not much longer. I just made the chutney in advance so the meal itself would be an especially quick one. I’m happy to have my homemade chutney and plenty of it because it’s also used in recipes for peanut tikkis, tamarind-glazed honey shrimp, catfish curry, and the tamarita which is a tamarind-flavored margarita. You can use brown sugar instead of jaggery, but since I was going to the trouble of making a homemade chutney, I wanted it to have the flavor of jaggery. That flavor is like molasses with a hint of smokiness. I bought enough that I can use some for cookies, and I can’t wait to taste them. Chunks of jaggery are very firm, and the best way to make them usable is to whack them with a hammer. I put a big chunk in a plastic bag, covered that with a towel so the plastic wouldn’t rip, and gave it a few wollops. It crumbled into a powdery pile after just a couple of hits. The jaggery was combined with pitted dates and water in a saucepan, and that was simmered for about eight minutes. Tamarind paste was added, it was blended until smooth, and then it went back into the saucepan with hot chile powder, ground ginger, garam masala, and salt. It simmered again until thick, and then I refrigerated it until the next day. Making the stir fry was as simple as can be. Chicken was cut into cubes, serrano chiles were halved, garlic was sliced, and shallots were chopped. The shallots, chiles, and garlic cooked for a bit in vegetable oil, and then the chicken was added. Once the chicken was cooked through, turmeric, red chile flakes, and salt were added, followed by the tamarind-date chutney. All the while, basmati rice was cooking. I sliced a piece of serrano to use as garnish, but I should mention that those slices were not needed for any added spice. The halved serranos that cooked in the oil along with the red chile flakes gave the dish a very good level of heat which I enjoyed. The chutney was a nice, sweet, sour counterpoint to that heat giving the dish exciting, varied flavor. This is a meal that will be repeated often, and next time I’ll think to mix up some tamaritas while the rice starts cooking. very enticing! i made a bhide recipe over the weekend, too--it was surprisingly complex in flavor for being so relatively simple. i think i will name my first born jaggery. What a great dish. 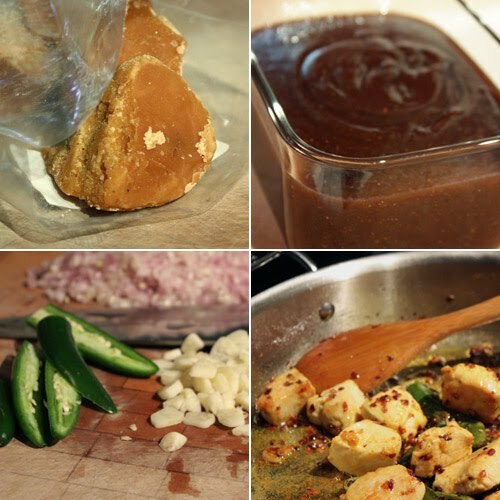 I would love to try your recipe for the tamarind chutney. I grew up in the Philippines where they add green tamarind for Sour Soup. I still make the sour soup here in the US but there's no green tamarind available here, I use the powdered tamarind that comes in packets sold in Asian Markets. I love to try your recipe with the catfish curry that you mentioned here. Oh I love tamarin, like in most of SE Asian country, we used them a lot in Indonesian dishes as well. You really explore your culinary adventure Lisa. I like that! i love tamarind chutney on potatoes in chaat so i bet this is great. good for you for making your own. Very intriguing preparation with tamarind! I haven't cooking with yet, sounds like it adds terrific flavors! Distracted momentarily by the mention of tamarind honey shrimp, but back to chicken...Glad to hear you made the chutney by hand. So much tastier sometimes! Great flavours, I love cooking with tamarind. I really love tamarind - have only had it in Pad Thai. I love the sound of your chutney and with the spicy chicken must of been absolutely delicious! Wonderful dish, I know I would like this, I really do like the flavour of tamarind. I've only really had it in a condiment kind of form before (imblee). 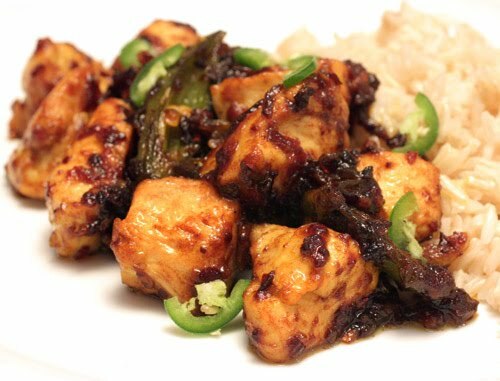 Never tasted or tried tamarind chicken. Love to try it sometime and awesome pics..
Good for you for taking the time to make your own chutney. I bet it tastes wonderful, too. What else will you use it on? Tamarind is a very interesting ingredient that adds a lovely flavor to dishes! That recipe is wonderful! YUM! I see you corrected the spelling issue with jaggery (saw your tweet) =) This recipe sounds amazing and I love the taste that tamarind imparts. Oh Lisa, I never used tamarind...the chicken look so tasty, spicy...really looks yummie! I love tamarind. In the Philippines, it's used as a souring agent for soups and made into a sugar treat. I'd love to try it with some chicken next time. Intriguing, there are so many new ingredients in this recipe. I've never used jaggery nor tamarind paste. This looks like great recipe, and worth seeking those obscure ingredients. I've never tried tamarind nor jaggery before but the ingredients sound interesting and surely the chicken tasted great. You had quite an adventure making this tamarind chicken :P I always tend to think homemade is better than storebought so I'm so glad you made the tamarind chutney from scratch. I bet it tasted better. I love the flavor of tamarind! This chicken sounds like it's bursting with flavor. Definitely not another boring weeknight chicken meal. This is really impressive, Lisa. You made your own chutney from scratch! That is true dedication. I'm loving this recipe and the photos are really making me hungry. Will be interested to see what you do with jaggery in a cookie recipe. I love the use of tamarind in many of our cooking here. We have tamarind squid and shrimps. 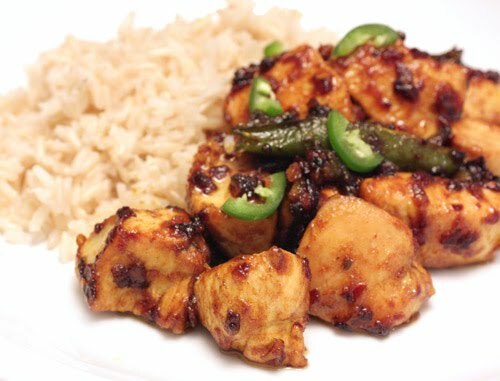 Tamarind chicken sounds equally delicious! I have a block of tamarind in my pantry, and right now I'm assembling a few recipes to use it, so this goes right into that folder. This looks like I could have for dinner.One flavorsome dish. I have been MIA and missed a lot of the posts. Oh, this looks FABULOUS!! Kudos for making your own chutney; I wouldn't have the patience but I imagine the end result was amazing. Can't wait to make this dish!